Low Cost PC, Low Cost System, low cost Mini PC, $100 PC, Low cost Computer, Low cost Desktop PC, Low cost Server. Options: Friendly small linux preinstalled on SD card, office suite etc. Options: 2x LAN, 2x COM, Mini PCI slot, 2.5in disk, Wifi, UK plug adapter. TQ-50 1Ghz x86 System 512Mb ram, SD slot, AC adapt. DIO. CE FCC. Options: GPIO DIO Digital IO, 2x LAN, 2x COM, TV Out, RS422 RS485. MB- Ask for various other models 6 Com, 4 LAN, i3 i5 i7, or rugged style. CE/FCC, Options: DDR2/3 Ram, 2.5 disk, SATA flash, Wifi, PCI riser/card, 3 LAN. Low Cost Servers: Why pay 2x to 5x more for servers with less performance? Many 2U Rack Mount Xeon systems from others cost 3x to 5x EWay low prices. Linux Server, Windows server, CentOS, Linux Server, RAID, NAS, DVR Video, etc. H110/H170 Chipset, Certification: Mainboard/Chassis/Power supply: CE FCC, RoHS. 6x SATA 3, RAID, 2x USB 3.0, 4x USB 2.0, HDMI / DVI, VGA, 1080p HD, DX10.1. Certification: Mainboard, chassis, power: CE, FCC, RoHS. H110/H170 Chipset, CE FCC, RoHS. Options: Ram, 3x 3.5in disk, Wifi, 3 Com, 3rd PCI LAN. Ask for Rack Mount quote: Xeon E3 E5, Top End Performance, 512Gb Ram 16 slot. Redundant 2 in 1, 4 in 1 servers, AMD Bulldozer FX8350 4.0Ghz, 40 swap disk. High end 2U Rack Mount Servers cost 3x 5x more elsewhere. EWay: Under US$1000. 1 PCIe slot option. Certification: chassis, mainboard, power: CE, FCC. Option: Ram, 2x 3.5in disk, Wireless, 4 Com, PCI Riser, 1 PCIe card option, 3-4 LAN. 4 Ram slot 64Gb max, 1151 Socket, Certif. Mainboard,Chassis,Power: CE, FCC, RoHS. Options: X70 Intel E5 Xeon 2011-3, C56 Intel i7 E3 Xeon 1150, or AMD AM3+ FX-9590 CPU. Power sensor, thermal sensor, fan sensor, alarms, redundant power supply. Options: 10Gb LAN x2 x4, up to 40x 3.5Inch 3Tb Disks, E5 Xeon CPU, Ram. 6x SATA 3, RAID 0 1 10 JBOD, 6x USB 2.0, HDMI, DVI, VGA, 1080p HD, PCI/PCIe. 2 Ram slot 16Gb max, Certification Mainboard/Chassis/Power: CE, FCC, RoHS. 4U Blade System: 10x Server board, Each Blade: server board, Ram, Disks, power. 42U Rack system, 20x Redudndant Blades/power, thermal/fan/power management. 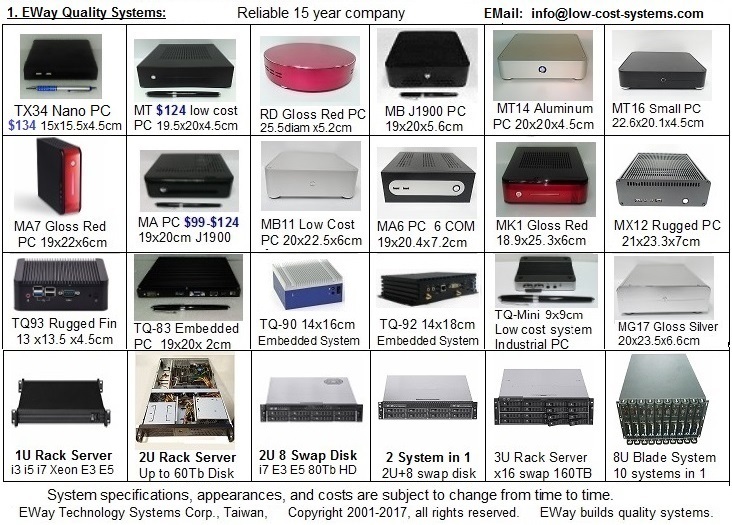 Certifications: Chassis, mainboards, power etc CE, FCC, RoHS, UL Power etc. Performance: 40x 25,000 Mark (passmark), Estimated 5x faster than M9000.